alright... i have had numerous requests for a review and comparison of the Chassis Tech upper control arms with camber plate that i puchased and used in my build thread. THESE ARE AVAILABLE FOR 3rd, 4th and 5th gen preludes. THIS REVIEW IS ON A 4th GEN! comparison picture between oem and Chassis Tech. the Chassis Tech unit feels slightly heavier then the OEM unit. this is expected considering it is made of thick steel and has a large camber plate with matching hardware. you can also see that the Chassis Tech is slightly longer. This created a bit of an issue... this is explained below. as you can see, the welds are pretty clean/decent. it also uses some pretty heavy duty hardware. 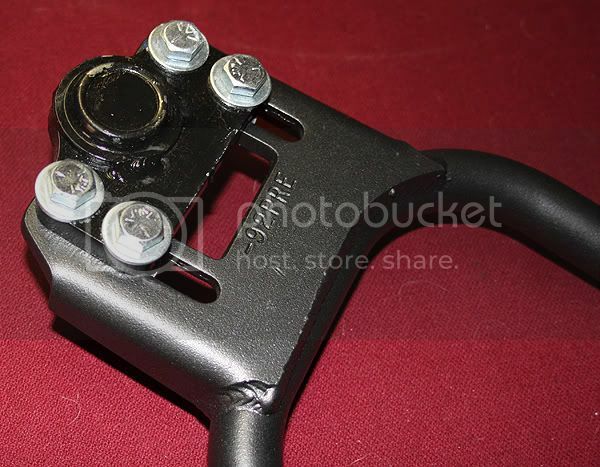 the chassis tech obviously come with a new ball joint, so for the price you are definitely getting your moneys worth. the adjustment is a quoted +2.5 to -2.5 which is the best front camber adjustment offered for the prelude. it is also very solid.. i dont see this thing breaking. and after 6 months of use it has held up very well. these pieces are not all perfect.. getting the joints in place can be a bit tricky because it is a tight fit on some. with a rubber mallet you can knock them into place though. 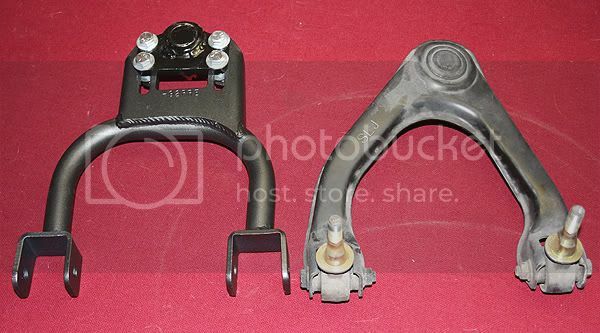 after using these Chassis Tech control arms on my 94 JDM prelude and also just recently installing them on my brothers 1995 USDM prelude i have come to the conclusion that these arms are somewhat poorly assembled. i am sure the company has to be using a jig of some sort to make sure all of the arms are build the same but they either rush or the jig isnt very effecient. 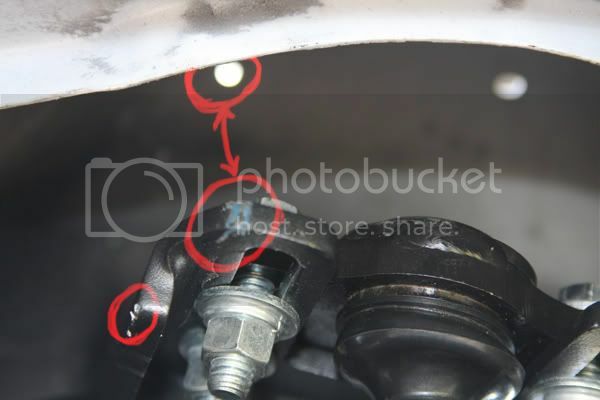 the outter piece that holds the camber plate in place seems to be in a slightly different location, like it was guess fitting and then they just welded it in place. it is not noticeably off (as far as looking at them go) though so the difference is very minimal. however... my brother ran into rubbing issues. the inside of the shock tower was rubbing really bad on both edges of the portion that the camber plate bolts onto (see picture below). my brother and i are both running the same suspension and the same ride height. to start with you can see that with the Chassis Tech arm being longer then the OEM arm is creates a tiny bit of a clearance issue. 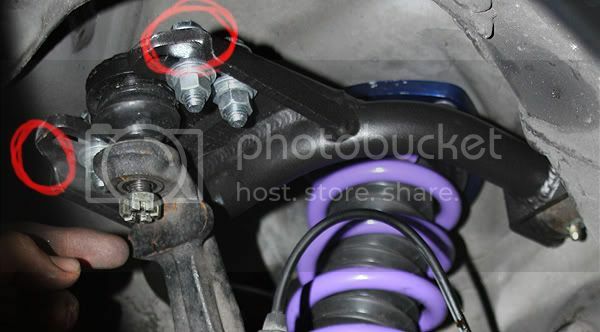 the arm may rest on this little section circled below when lowering the car off the jack stand after installation. this is not a big deal. if you take a hammer and knock spine out just a hair it clears with ease. this is not an issue when the car is being driven... only when you are lowering the car back down after having it in the air. here is the clearance issue. we couldnt source the problem of the rubbing (squeeking noise for about a week and a half). we thought it was the upper control arm bushings we we replaced those with poly bushings and grease fittings. this wasnt the issue. as shown below you can see where the edge of the metal on both outter corners (circled in red) were rubbing against the inside of the shock tower. to remedy this we took the suspension off and took a mallet to the inner fender. after a few good hits the UCAs cleared with no more rubbing issue. the inner shock tower is double layered and the layers are spaced out from eachother. knocking in the inner portion a little will not effect the outter shock tower so this will not be visible in the bay. overall i like the Chassis Tech arms. they are very sturdy, extremely well priced, it offers the most camber adjustment available for preludes, it comes with a new ball joint, and they have numerous powder coat options for a minimal additional $15 cost. the company also has good customer service from what ive had to deal with. 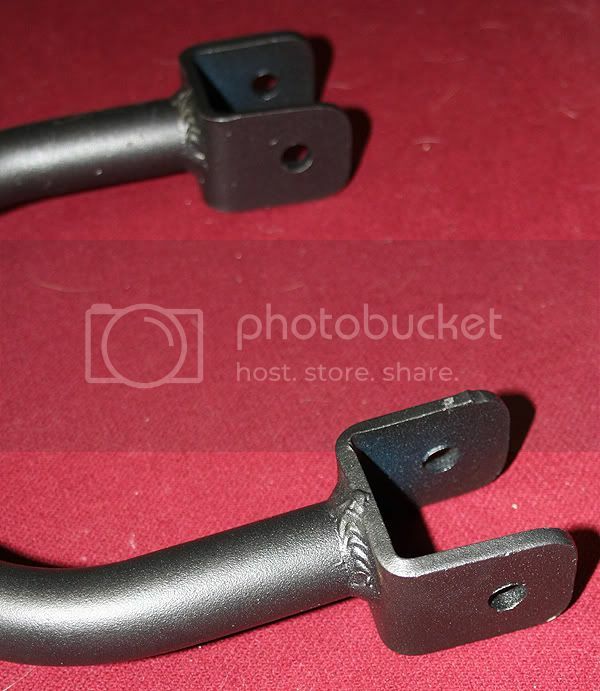 the price when i purchased them was $125 with $15 for powder coating and free s/h. this price has gone up over the past year and is now $144.95 with $15 powder coating and $9.99 s/h. 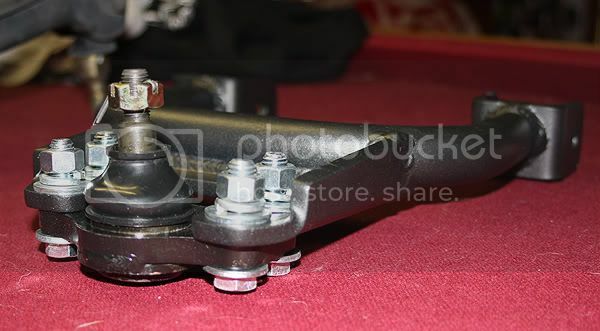 but still for $170 you are getting a new ball joint, maximum camber adjustment and a strong UCA. compared to SPC ball joint camber kits (which i am running in the rear of my lude, so is my brother) which are normally around $150 for 2 and offer -1.5 to +1.5 of camber or ingalls camber kits which replace the UCA bushings that cost around the same price but only offer +.75 to -.75 of camber these UCAs are very well priced. WARNING: if by chance you are trying to get even more camber adjustment for some reason. 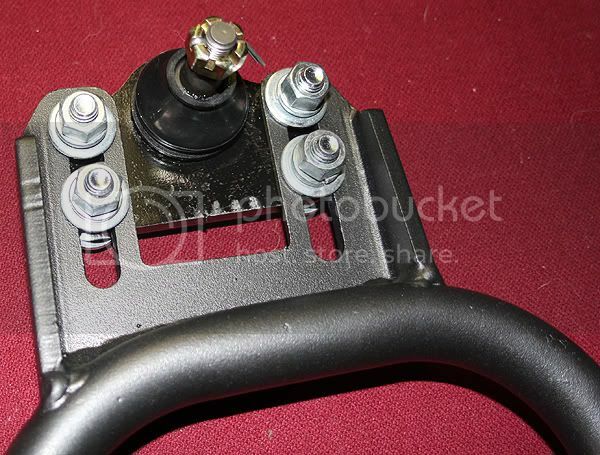 the ingalls camber kits that replace the UCA bushings will not work when using Chassis Tech UCAs... it pushed the arms out a little bit farther even on the lowest setting and the UCA will not clear and your car all be resting on top of the arm (i tested this). however, replacing the ball joint on the Chassis Tech arm with a SPC ball joint camber kit should, in theory, allow an additional -1.5 to +1.5 of camber. however i dont know if this will create clearance issues. Other Suspension Steering items - Get great deals on Suspension Steering, Car Truck Parts items on eBay Motors! if anyone has any further questions or concerns let me know and i will do my best to answer them. i hope this helps for those who are interested. i have talked to another member on nwp who purchased them for his 4th gen and he sent them back due to fitment issues. like stated above they may require some modification to run them... i had no issues at all with my set but my brother had a number of issues. So, they only make them for the front? I ran an spc camber kit on my last car but I have been wanting something different for the new project. But if they are only for the front then I would just go with the spc all the way around again. yea they only make them for the front. i am using the chassis tech up front and the spc ball joint kit in the rear. in my personal opinion the spc unit would work just fine... they have good range as far as adjustment goes and work just fine. if you want additional adjustment the chassis tech uca's have a wider range for negative or positive camber adjustment. they are also only $130 for both UCA's i think and thats powder coated and those come with brand new ball joints as well. i am pretty sure the spc kits for the front cost $150. with the spc ones you dont risk having to do any modification for fitment. like i show in my review... i had no issues at all with my Chassis techs and i really like them. my brother had fitment/rubbing issues with his. chassis tech obviously doesnt use a jig of any sort when assembling/welding the pieces together. Well, very good review for sure. I will probably just go with spc again but I like seeing new products for our cars. Off topic: I like the way you are going with your car and the k swap. I was going to do that with mine, had a k24a4 in my garage for months but decided to hold out (Got laid off) and sold my engine. I plan on going the j route once I start getting good money coming back in again. I have a friend that lives close to me (invadertrax) going the same route after we talked about it. It's good to have someone here not afraid to be different and show off swag . haha thanks man, i look forward to seeing you progress on the j too. I know what I said before but after thinking about it... I am ordering these mmmeeeeooooowwwww! Ok, so I got mine... first off I am a little disappointed already. They come assembled wrong... and tightend with the slide brackets crooked... My main disappointment is they came with no instructions on torque specs or anything. Customer service is a huge thing for me and this just bothers me. Also, I had no choice of color when I ordered and was not contacted to ask what I wanted... So, I assumed they would just come black and they came in a blue pearl color. After all this I really really hope they are a good product. Campbell, what did you tighten these down to? Alright, well I just got off the phone with the distributor and at the moment I am not to happy. I called asking them the ft-lbs that the bolts need to be set to and I had to repeat myself a few times because he didn't know what I was asking for. Then out of nowhere he said 30 ft-lbs should be enough. To me that doesn't seem right, it might be but the way he just pulled it out of thin air like that kind of put me off. I feel like the product should have came with at least torque specs for the bolts. i agree with you, their customer service is not very good. the camber plates coming tightened down crooked isnt a big deal because you need to adjust them yourself anyways when installing so you arent hella cambered.. when you get your alignment they will adjust all of that anyways. i tightened them down pretty tight and then drove it to the shop the next day for the alignment. i dont know what the shop torqued them too but whatever it was it worked just fine because i have never had a loosening issue. i stated in my review that you have to call them to set up your invoice prior to ordering if you want to specify powdercoating (color). Oh, oops on the color thing. I just assumed they would be black that's why I didn't worry. I know I have to adjust them, I will personally be doing the alignment, but it would have been nice if they at least put them together correctly just so I wouldn't have to take them apart and put them back together. Not a big deal I think I was just pissed off last night for no real reason. But, I guess I will just tighten the **** out of them when I do it. So far, the product looks strong and worth the money so they get an A+ on that end. As far as customer service they are an F-. ya let me know you opinion after you get them on. they are definitely very sturdy/tough arms from the look and feel. mine and my brothers were assembled correctly when we got them so you just got unlucky on that end. Ok, they are on and aligned... I think they screwed with my caster though... I am going to get a traction bar soon, once again the caster didn't really want to move. Also, I got them as tight as I could get them sooo I reeeeeally hope that they do not come loose and move.